COLORADO SPRINGS — The advisory group of the National Space Council wants to take on a role evaluating NASA’s plans to return humans to the moon by 2024, once those plans are developed. 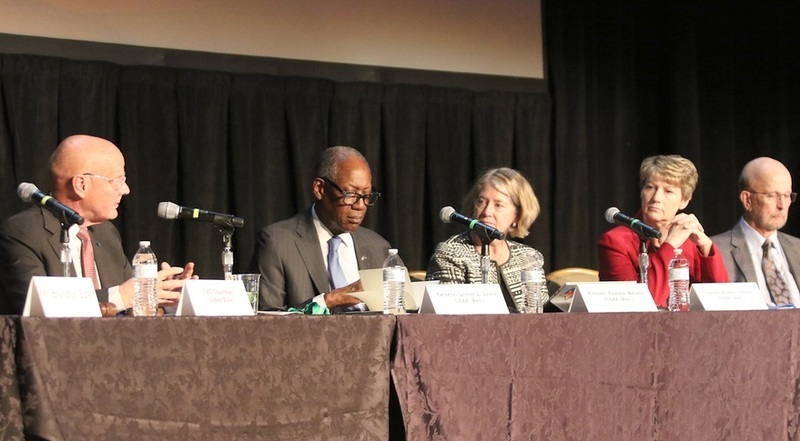 During a meeting of the National Space Council’s User’s Advisory Group (UAG) meeting here April 8 during the 35th Space Symposium, members supported, but did not formally approve, a proposal to establish a task force that could serve as a “red team” to review NASA’s new exploration plans. That proposal was put forward by Lester Lyles, the retired Air Force general who serves as chairman of the group’s exploration and discovery subcommittee. The task force, he said, would consist of UAG members or subject matter experts they would designate, and could also consider “external assessments, advice or inputs” to support their evaluation. The goal of the task force, he said, would be to serve as a “value-added red team before a revised architecture by NASA is finalized.” That work, though, would not begin until NASA drafted at least an initial version of its revised plans, which remain under development. The group was already interested in ways to accelerate NASA’s plans prior to the March 26 speech by Vice President Mike Pence at the National Space Council meeting in Huntsville, Alabama, where he directed NASA to achieve a human landing at the south pole of the moon within five years. Members of the group had complained about a lack of urgency in NASA’s earlier plans, which called for a human landing by 2028, during their previous meeting in November at NASA Headquarters. The proposal got a strong endorsement from another member of the Users’ Advisory Group. “That is an excellent recommendation,” said Tory Bruno, president and chief executive of United Launch Alliance. He added this his company would be willing to provide resources to back that task force. Ellis ultimately decided to work with Lyles to refine the proposal to establish a task force and create a “terms of reference” for that team. That revised proposal will be considered by the Users’ Advisory Group at a future meeting, yet to be scheduled. Separately, NASA took a step April 8 towards implementing that lunar landing goal. In an internal memo, NASA Administrator Jim Bridenstine said he had named Mark Sirangelo as a special assistant, advising him on exploration efforts. Sirangelo is a veteran aerospace executive who, until last summer, was executive vice president at Sierra Nevada Corporation’s Space Systems. Sirangelo “will have broad responsibility to work across the Mission Directorates to further develop the agency’s plans for the Exploration Campaign,” Bridenstine wrote in the memo. “This includes a strategy to meet the Administration’s policy to return astronauts to the lunar surface by 2024.” He will also lead planning for the new Moon to Mars Mission Directorate, which Bridenstine announced at the National Space Council meeting in March to oversee the revamped exploration program.